It's more than a passion when it comes to classic cars. There's a sense of nostalgia for the touch and feel of these classic cars even before any ownership takes place, and by meeting like-minded people, we share the duty of taking care of each other's collections whenever one is not available to do so. And the lasting impact has become our friendship. In addition to the Morgan I have other classics. It is kinda common I think for all people interested in classic cars to have quite a few over the years. For me it has been a longer list than I expected. And I have long since realized that I am not able to keep them all. So for each time I buy a new car or a project, I also go to ebay to buy a model in scale 1:43 of the same. Preferably in the same color. The last count in my cabinet shows over 40 models, and I am still collecting. Anyway, Here is a few images and comments about the cars which just now are, or have just passed through my gararges. Not all of them are classics yet, but I have a feeling quite a few of them will be in time. Morgan +4 DHC - 1955. This is the current state of my car after I started restoring it. A lot of work have been done, chassis, new body, new panelling, restores brakes and electrics. Major work missing is completing the electrics and new paint. The cars is registered and driveable. 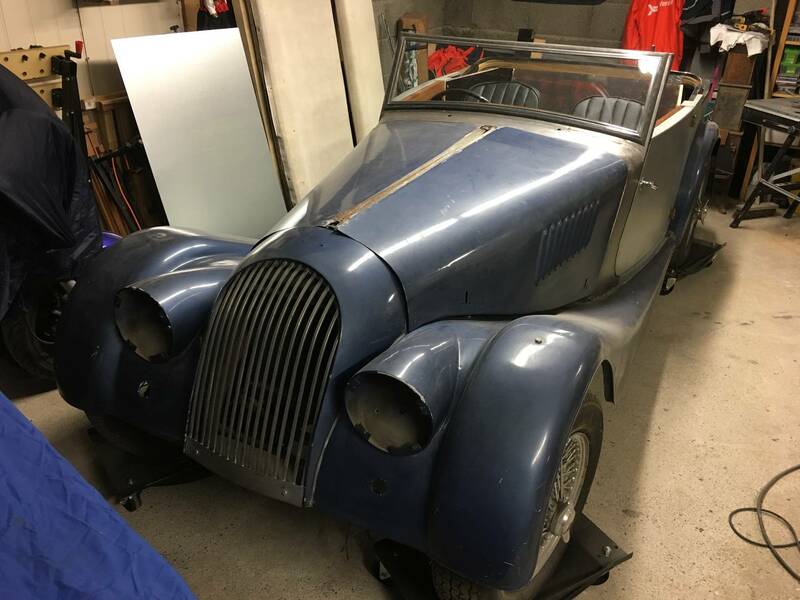 My Morgan was originally a +4 DHC 4 seater delivered from the factory, also known as a SnobMog. The missing louvers on top of the bonnet, four seater firewall and VIN shows signs that this 2 seater have a past which was different than what it looks. 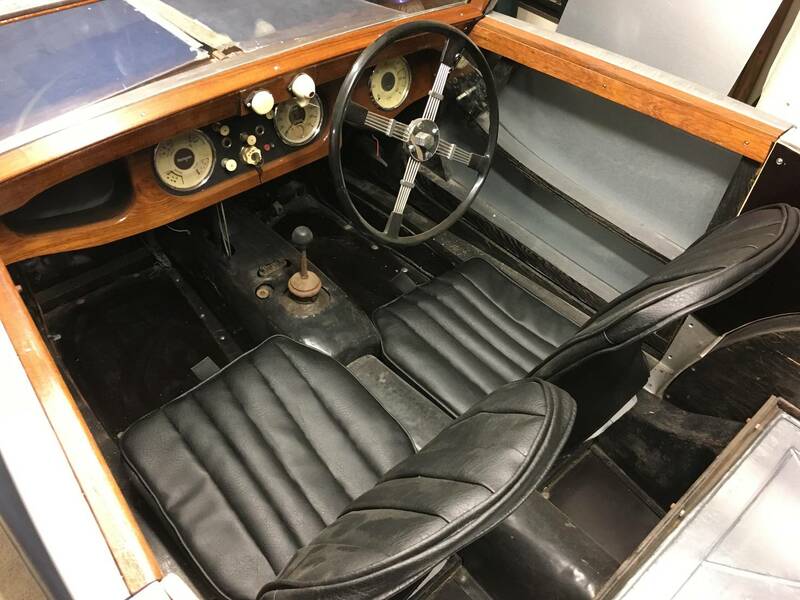 The car was restored by the previous owner with a factory new body from a 4/4 - 2 str in the late 70's. This made the car appear a little off set. 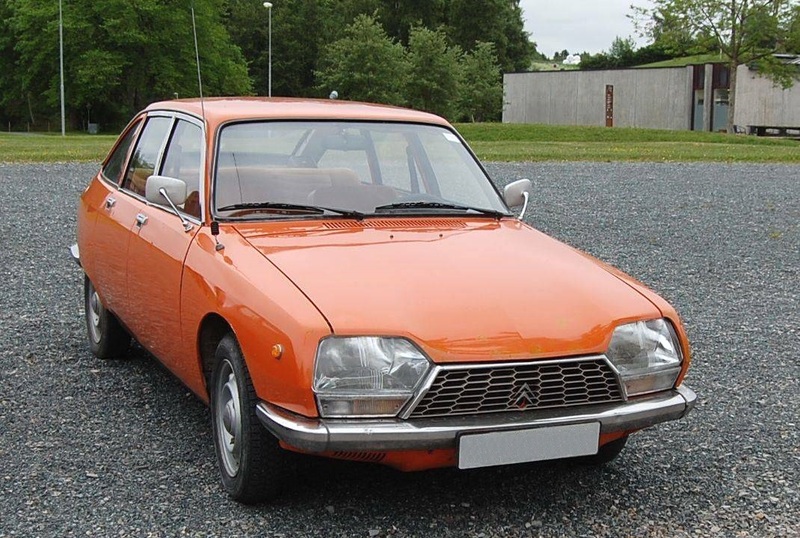 My second car was an orange Citroen GS. I crashed it, and it was written off when I was 20. I have font memories of the car, and the trips with it. Which eventually led to a wish to have one. And you know what? When the same model, same year of production and same color was was offered for sale, I did buy myself a new one again. The flat aircooled four have a distinct sound, just listen this GS which is is handcrank started. Probably the most technically dense car within its market sector, the GS beat her stablemate the SM to the Car Of The Year Award on its launch in 1970. 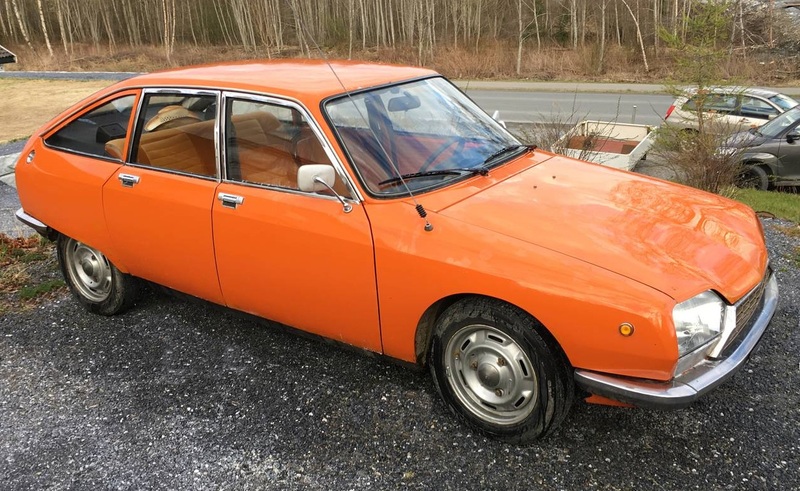 In a market sector dominated by cart sprung, rear wheel drive cars, the GS provided the proven hydropneumatic suspension and powered brakes of the DS in a medium sized car. 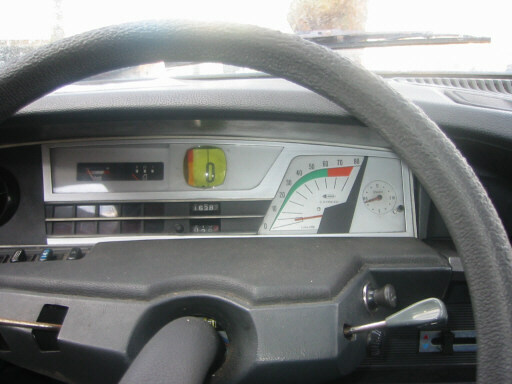 I grew up in a family with Citroen owners and from this my childhood memory is colored with fixing and driving Citroens. This was in the late seventies so it was mostly Citroen GS and Citroen CX. 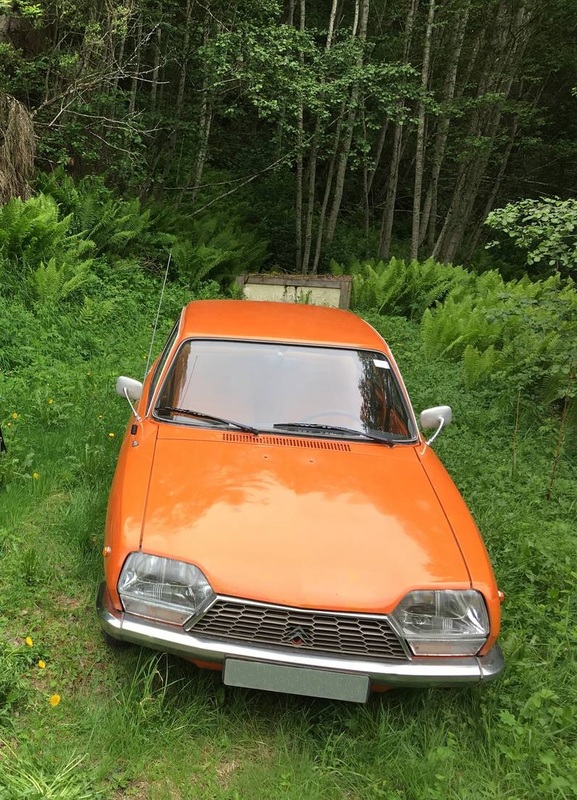 I come from a small town in the middle of norway with only 20.000 inhabitants, but when I look at the productions figures of the Citroen GS, and the number of them we had just in our family, and I dare say that our family alone made our town the most dense Citroen GS area in the world at that time! I believe we had at the same time 3 Citroen GS's with a total of 5 before my father "upgraded" to Citroen CX. 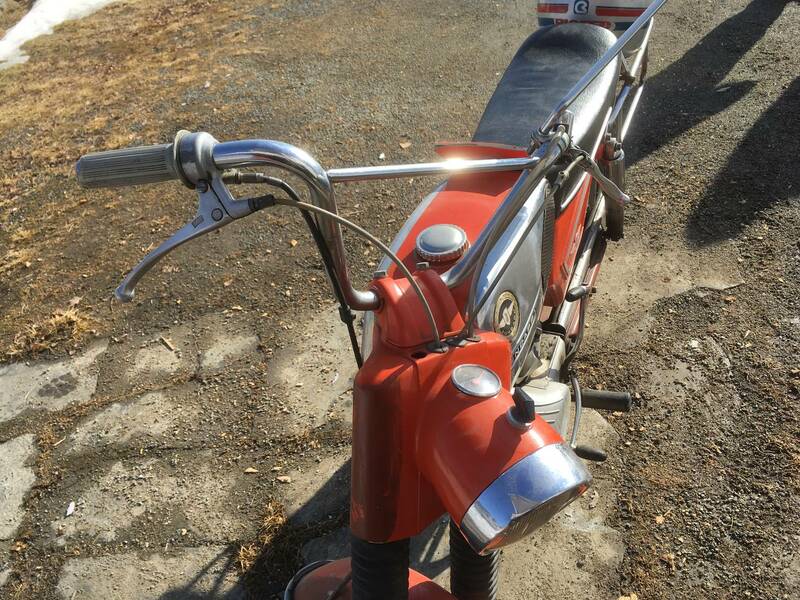 My memories of the little air cooled 1019 ccm boxer engine is not only fond ones. But for some reason I for years still wished I owned it. 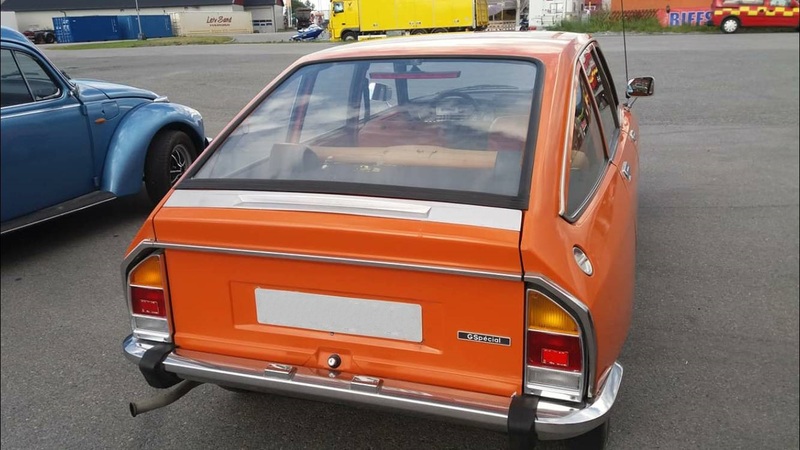 The car was a G-Special from 1976 with orange interior. 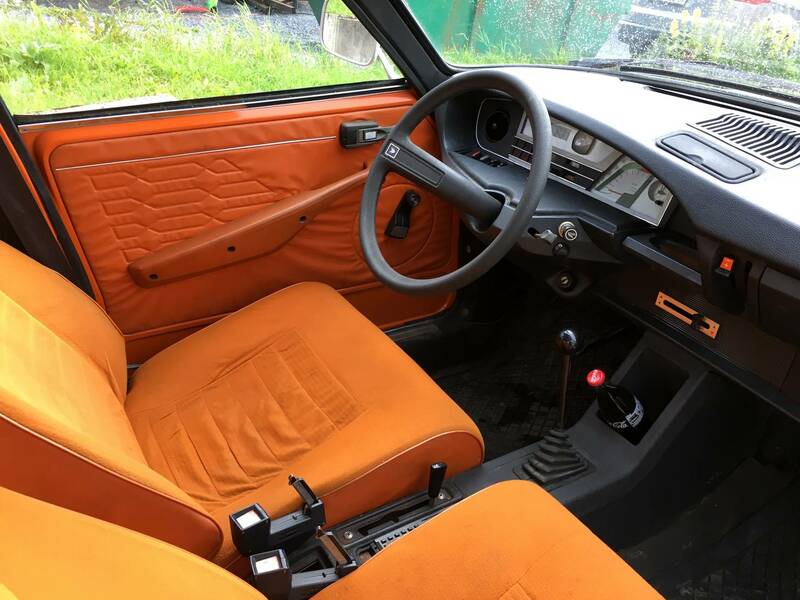 The car was orange, the door covers was orange and the seats where orange. I made the dot under the exclamation mark by adding a orange carpet in the back window. It was sort of surreal inside with a bathroom scale speedometer and powerplant looking rev counter in brushed aluminium surrounded by all this orange. 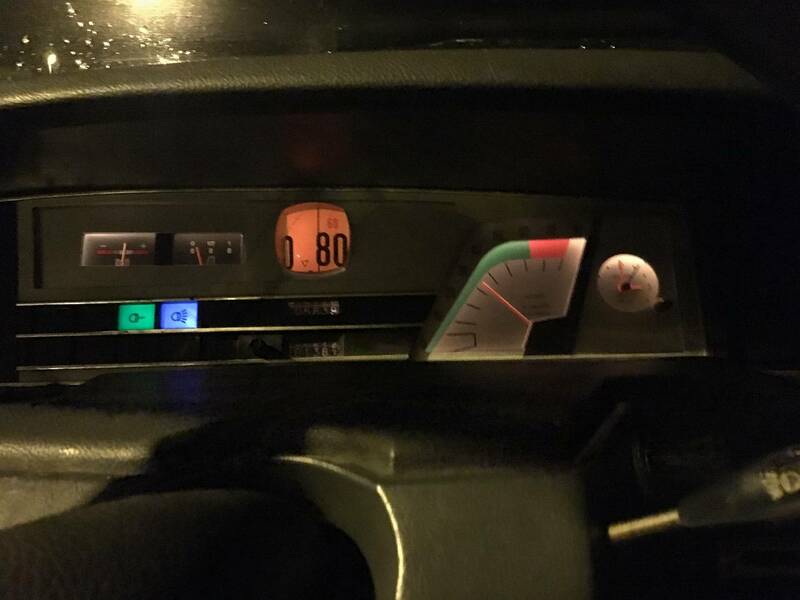 The car had many quirks, it was immensely cold in the wintertime beeing aircooled. It had a tendency to completely fog itself up when you drove into deep puddles. If you took a puddle to quick the car could fog itself up completely in a split second. Resulting in no view whatsoever and a damp car for a week. But apart from this and maybe to much repair, the car offered an extremely good handling in its time. Here is a link to a video where you can see the car outperform almost any car of its era: Citroen GS on 3 wheels! The commercials for these Citroens, are very french and somewhat amusing. I have always liked these pugnosed Cezeta's. The design is so unusual that if you pass kids playing, they will stop and simply look at you. And this suits me just fine. under the name Type 506.. Go and check out their webpages by clicking the logo above. The 506 is a very cool and modern driving machine! 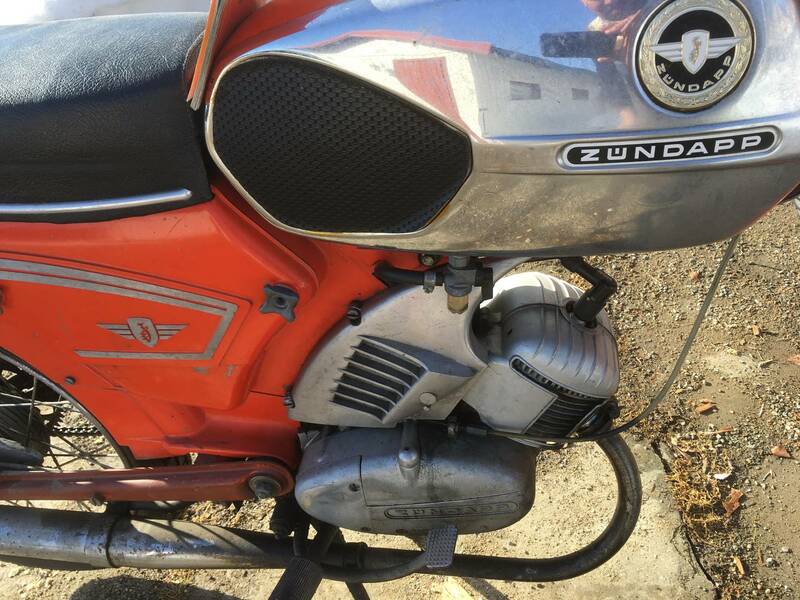 Zundapp C50 Sport moped from 1971. 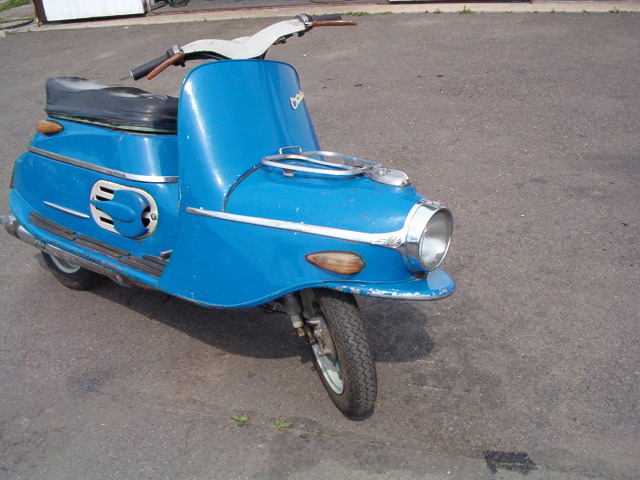 My first ever means of transport was a moped when I was 16. 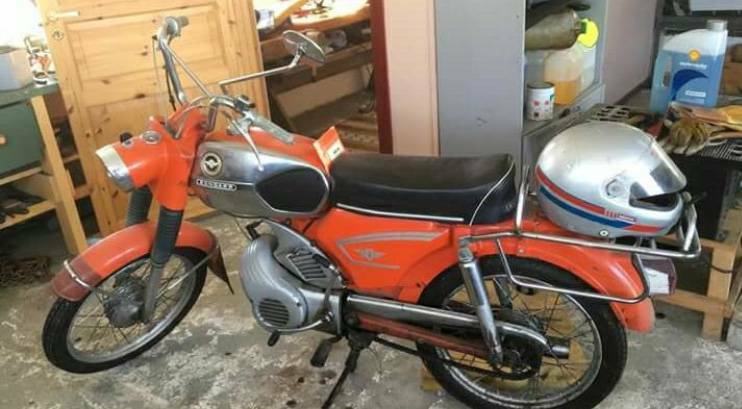 I inherited a 1971 Zundapp C50Super from my grandfather. 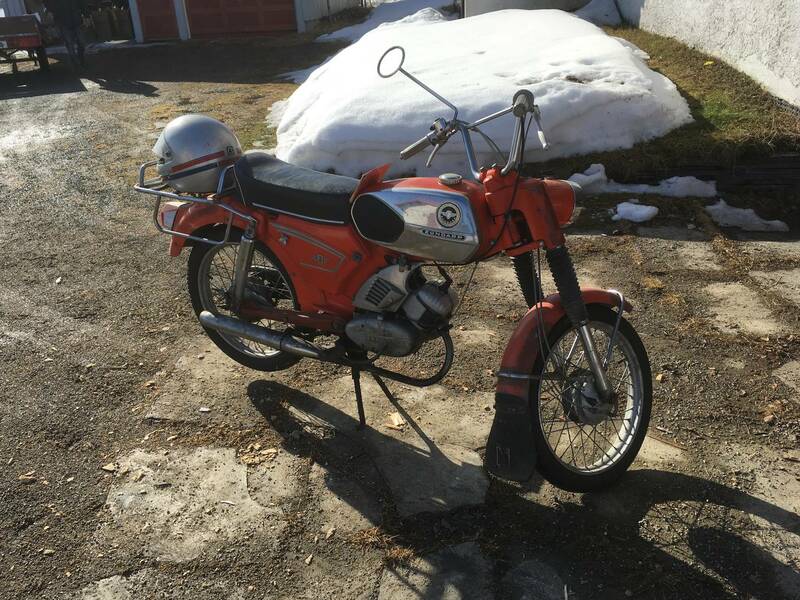 The bike was very nice and not much used, and it even did go very well. Removing the power reducing unit in the knee exhaust tube, it could even do 70 km/h on flat roads. I remember painting mine black since I did not like the fire engine red color of it at the time. Today my view upon this is ofcourse totally different. 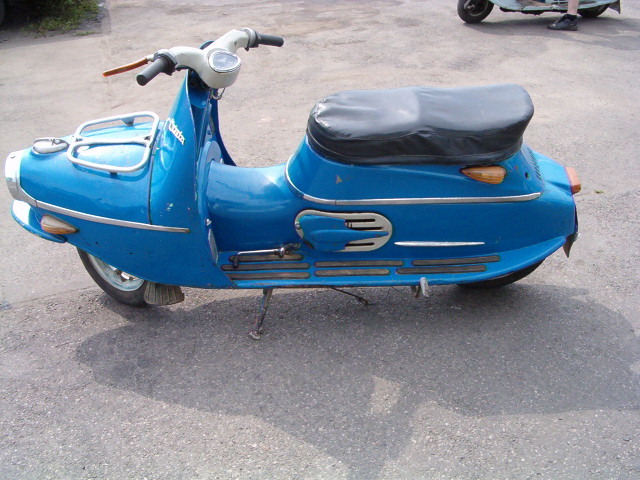 The color is one of the nicest touches of the moped, and I wish I could find one to buy. My bike ended up crashed by me in a the side of a Opel Ascona who did not respect the traffic rules by pulling out just in front of me. The bike was totalled, but I was almost unhurt. Only a few bruces. So all in all I was lucky. 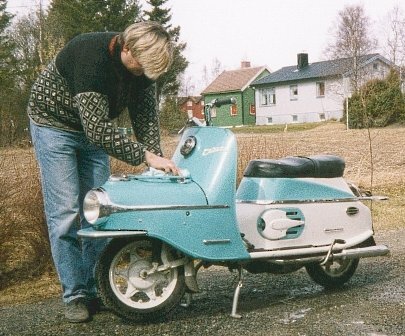 I remember how much this small 50cc moped was used, I virtually did drive it everyday. 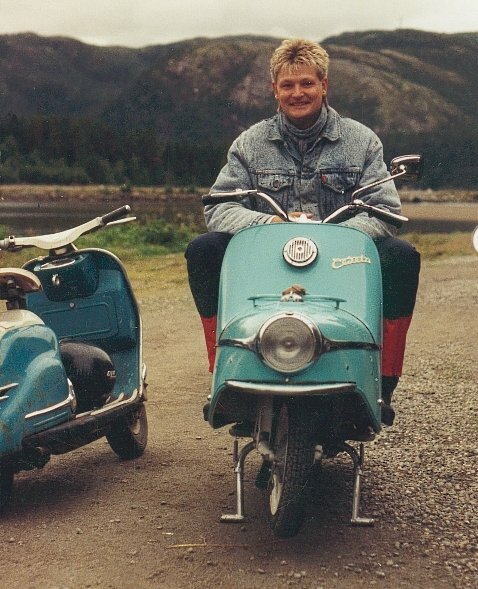 And after 20 odd years my brother could tell me he drove my moped daily beeing 14, and I never found out. I ws taking a bus to school and was home one hour later than him, and this hour he exploited fully to drive it as much as possible. The Triumph Sprint with its 900cc three pot engine were produced between 1991 and 1998. The Triumph Sprint is a competent sports-touring machine that rides like it looks - top-heavy, fast and oldtech. It's essentially a 900 Trophy with a Rickman-style fairing slapped across its mug, but the triple-cylinder motor makes a nice noise and it's reasonably comfortable if you can forgive the noisy, imperfect screen. The Triumph Sprint Executive comes with colour-coded hard panniers. 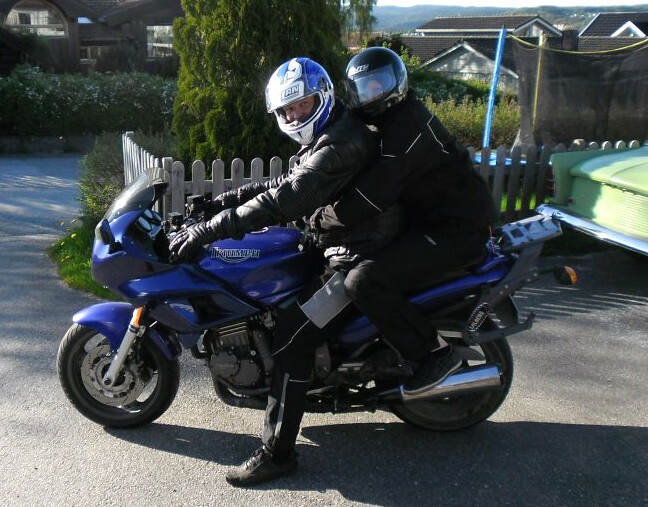 I bought mine for a few years ago, and since beeing tall and heavy myself the bike suits me well. I have a full set of bags, which provide excellent loading capacity. 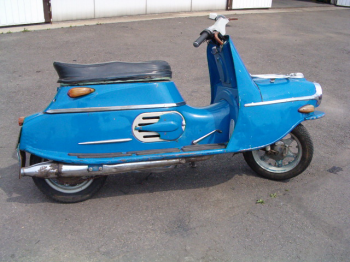 It suits me fine for long trips, and is relaxing to ride. The fact it is British is one of the major reason I like it. • Yes, it's are made in the UK. • It don't leak oil. • It is reliable. Well, most of the time. So what do you do when you cant keep them all? One sell them, sometimes with regret and sometimes without. I have sold some of my classics and replaced them with models in a cabinet in my livingroom. Collecting cars and bikes are fun until you realize you have no space for them all. Normal houseowners like me can at most have 3-4 classics at a time, before one have to find storage for them. My solution has been to collect toy cars of all the cars and bikes passing my ownership. And for someone liking to collect like me, nothing could be better. My rather patient wife is happy to have a glass cabinet in the livingroom compared to have a bunch of cars in front of the house too! I have collected quite a few of the cars I have had in my life, but still is missing a few. I find my cars on Ebay, usually at a resonable price. Some cars I have had to pay top dollar for tho, and some I did even leave bidding since I found the price to steep. I concentrate on the 1:43 scale for my cars, this means small cars (6-8 cm) with a lot of detail. I have also smaller scale (1:56 and 1:72 for some models I havent found in the 1:43 scale yet. And also some larger scale models 1:12 and 1:8 for some, since I could not resist them when I found them for sale. My goal is to find the cars in the correct color, but sometimes this is not possible, so I will have to settle for a different color. Some times models are not available of the exact car I had. For such cases I buy a model which is close in age or set up which I then modify to look like the one I had. I can also some times repaint the models in the correct color if I am not happy with the finish on them. To sum up this hobby, it is a bit about the cars, it is a bit about the ownership, it is a bit about the technology, it is a bit about the nostalgia, but it is a lot about the people you meet in this hobby! A lot of fun and work! I have always liked cars, bikes and scooters. The hobby has given me both experience, fun and money for the classics now in my stable. And not to forget, all the excellent people I have come in contact with having this hobby!